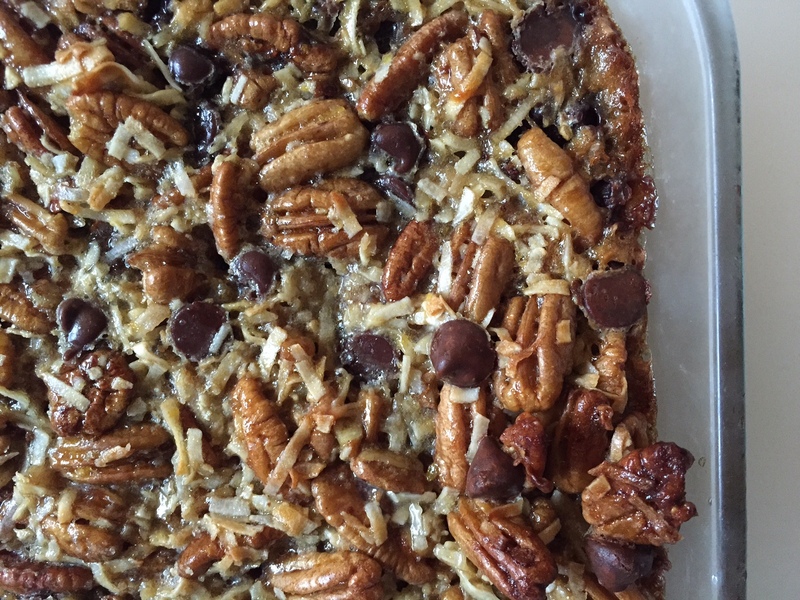 Baking Fail: Passover Pecan Bars – Voila! For all the wonderful, well lit food photos and glowing reviews of recipes you see on this blog, and other blogs you’ve bookmarked, there are hundreds and thousands of cooking and baking fails. I’m here to share my story. I was on a Passover baking kick. I made Mandarin Orange Kugel for the Seder. I made Macaroon Fudge Bars. I was getting ready to make a sponge cake but then realized I didn’t have enough eggs. 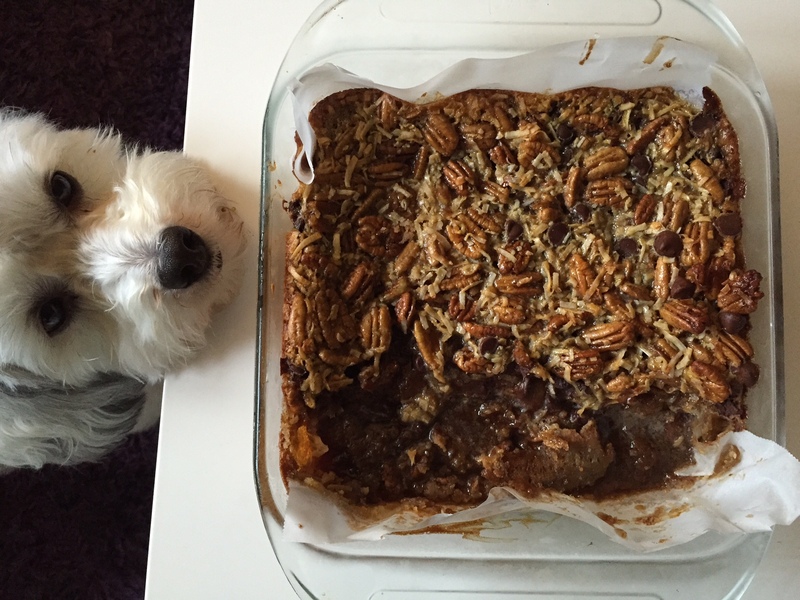 I turned to this recipe for Pecans Bars, checked the ingredients and voila! I was on my way. I read the cookbook and I saw ‘grease a 9×13 or 8×8 baking dish.’ A brief thought flashed through my head reflecting on the two very different size pans this recipe recommended, but I moved on. I greased and lined my 8×8 dish, made the crust, baked it, let it cool, made the filling and baked it for the recommended 20-25 minutes. When I took it out, the top of the filling had set, but the inside still seemed a little liquid-y. The recipe also called for it to be served chilled. A little red flag went off but I thought to myself, ‘maybe it will cool and set in the fridge.’ So I let it cool in the fridge for about 30 minutes and then at 11 pm (I’m a nocturnal baker sometimes), I cut into it. And….fail! Okay Roo, you can have it. It’s just going in the trash anyway. The filling poured out like water breaking through a dam. What happened?! I re-read the directions a few times from top to bottom and finally came across my mistake: it recommended a 9×13 or 8×11. But the ‘x11’ part was cut off to the next line and I didn’t read it thoroughly. Lesson learned (and number one instruction from every cook and in every book): Read the directions carefully! “Ooooooohhhhh! Eight by ELEVEN!” The filling was too thick in the confines of the 8×8 dish and would have needed probably another 20 minutes to cook fully. And anyway, this recipe was also cloyingly sweet. 2-1/3 cups of brown sugar plus 1/4 cup of maple syrup. Way too much sugar. Which is why I’m writing this blog post at 12:45 a.m.